Cruise ship MV Clipper Odyssey carrying hundreds of foreign tourists will be anchored in Iboih, Sabang, Aceh Province according to Kompas. Sabang Tourism Office Marketing Head, M Ali Taufiq explains that the yacht was scheduled to arrive at 5:30 pm, Thursday, Jan 10th. "The cruise ship carrying 135 passengers and 69 crew members departed from the Port of Belawan Medan, North Sumatra". 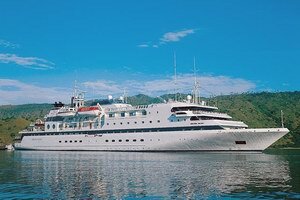 MV Clipper Odyssey was the first cruise ship which docked in the prime tourist destination of Aceh, Sabang in early 2013. The ship passengers have six hours to enjoy the beauty of natural scenery of Sabang, especially marine tours with a variety of coral reefs and other unique species in the region and Gapang Iboih.